"The wine quickly gained an enthusiastic following, particularly with women who enjoyed its aromatic effervescence with a hint of sweetness and its year round quaffability." OK, seriously -- what am I supposed to do with that? Now, I'm never one to look a gift from the wine fairy in the mouth before putting it down my gullet, but it's clear that I'm not the target audience for this particular sparkler from Biltmore Estates called Pas de Deux. As I've written about in the past -- wineries market differently to women and men. According to Leslie Sbrocco, author of "Wine for Women," women "look for the experience" in wine. "We think about who we're with, what we're eating," she said. "Women buy visually, paying attention to packaging. They look for a transition between day and night, work and play." This is one of the few bottles of wine I've received (shoutout to Lisa Klinck-Shea at Folsom, by the way!) where the press release and shelf talkers concentrated more on the wine's packaging than on the flavor and winemaking process. Most releases generally don't discuss the "attractive floral palette" of the label and the "sophisticated foil treatments in hues of pink" that create an "overall effect that is contemporary, fun, and of high quality." I don't mean this as a rip on Pas de Deux. Shoppers picking out a bottle take less than a minute to decide on a wine, in general, and the label and bottle design weighs heavily on the decision for most wine drinkers. 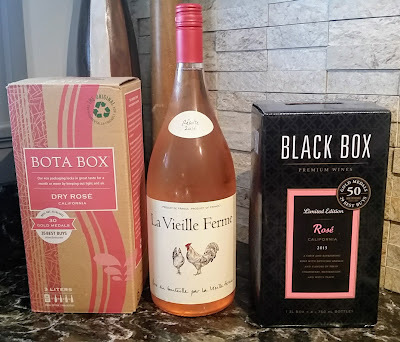 Let's just say that while I'm quite partial to pink wine, I'm not necessarily as likely to snag a ballet-themed wine, especially when the pairing recommendation is for "toasting the end of the work week or brunch with best friends -- and of course, chocolate-covered strawberries!" The winemaker, Sharon Fenchak, was inspired to make this wine after spending some time in Prosecco country in the Veneto. She wanted to create a similar wine for Biltmore -- so, 10 years ago, she experimented with a methode champenoise-style sparkling wine using Muscat Canelli sourced from California instead of Prosecco grapes. The result was a wine called Pirouette, eventually renamed Pas de Deux. Anyhoo, what is this wine? Muscat Canelli is better known as the grape that Moscato comes from. Now, this isn't a bad thing in and of itself -- Moscato d'Asti is a favorite brunch wine of mine. But regular "Moscato" that's not sparkling is normally similar in flavor to a non-pink white zin. Needless to say, I was hoping for the former. Since there's a winemaker in North Carolina inspired by Prosecco, making wine from the same grape as Moscato, who carbonated the wine via a traditional French method, how'd it end up once it was chilled down? Like an amalgamation all of those things. Prosecco tends to be very dry and apple-flavored. Moscato (especially Moscato d'Asti) is somewhat sweet and peachy with a light carbonation. Pas de Deux reminded me of a more highly-carbonated Moscato. It's quite floral and pineappley on the nose. There are some strong peach, orange, and strawberry flavors that creamily wash over your tongue. I was reminded a little bit of a Dreamsicle. The bubbles are even and lasting. The finish is pretty sweet. We tried it alongside brunch, and I would have imagined it would have been good with something like fruit crepes. Honestly, it didn't do a lot for me. I'm not really into sweet wines at the moment, but if I did want something along these lines for a fruity brunch, I probably would have gone with either the original Prosecco or the Moscato d'Asti, rather than a fusion of the two. For what it is, it's a pretty well put together wine. It's just not *my* well put together wine. Pas de Deux retails for $19.99, but I've seen it on sale recently for $13.99.